This artist's concept shows a glowing patch of ultraviolet light near Saturn's north pole that occurs at the "footprint" of the magnetic connection between Saturn and its moon Enceladus. The magnetic field lines and the footprint are not visible to the naked eye, but were detected by the ultraviolet imaging spectrograph and fields and particles instruments on board NASA's Cassini spacecraft. A shimmering patch of light as big as Sweden detected at the north pole of Saturn is the spectacular result of a giant stream of electrically charged particles from the planet's moon Enceladus, scientists find. On Earth, surges of charged particles from the sun colliding with our planet's magnetic field create the northern and southern lights, or auroras. Similar patches of light have been seen on Jupiter, caused by electrons and ions originating from that planet's volcanically active moon Io. Saturn also has its own aurora light show, which is created when solar particles from the sun interact with the planet's magnetic field. 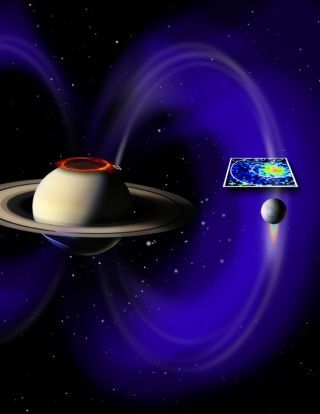 The new study, however, is the first time astronomers have caught a Saturn moon creating auroras on the ringed planet. Now, using NASA's Cassini spacecraft in orbit around Saturn, researchers have finally detected signs of these lights. The eruptions on Enceladus create a massive cloud of electrically charged plasma that shoots electrons and ions 150,000 miles (240,000 kilometers) along magnetic field lines to blast Saturn's north pole. The resulting spot of light measures about 750 miles (1,200 kilometers) by about 250 miles (400 kilometers), covering an area slightly larger than California. Scientists compared it to Sweden. The scientists note this patch appears to vary in brightness by up to a factor of three, suggesting Enceladus spews out matter at a very non-constant rate. "The electron beams flicker with timescales on the order of minutes," said researcher Abigail Rymer, a Cassini team scientist based at Johns Hopkins University. "It is a very dynamic interaction." Although it remains unclear what specifically is driving the cryovolcano activity at Enceladus, "one thing is clear: Enceladus cannot vent at this rate forever," Rymer told SPACE.com. "Scientists have been wondering whether the venting rate is variable, and these new data suggest that it is." The scientists detailed their findings in the April 21 issue of the journal Nature.